A lifetime’s career started with a high school art teacher trying to break up a couple of jocks screwing around wrestling in a corridor between classes. She grabbed me to break up the fight, longtime Old Faithful potter Carl Sheehan said. “You need to put your energy toward something more productive. You need to take my pottery class,” Sheehan recounted. Today, Sheehan’s work, which is sold in Yellowstone National Park’s Xanterra gift shops, may be found in homes around the world. He has created his Fire Hole Pottery since 1980. 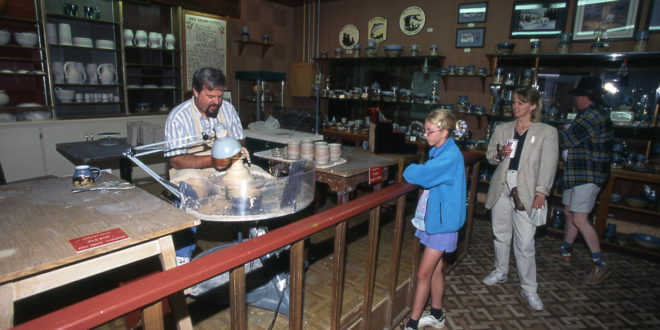 If you set foot in the Old Faithful Lodge gift shop anytime between 1980 and 2007 there is a good chance you got to see Sheehan in action, creating his signature pottery in a workspace that occupied a good chunk of real estate near the back of the shop. A combination of events including a remodel of the gift shop and his family growing up and dispersing led to Sheehan’s decision to remain in west-of-Belgrade-Montana following his last full-time summer at Old Faithful. But the Lodge gift shop—as well as those at the Inn, Mammoth Hot Springs and Lake—continues to carry his signature work. But he still goes back to the Old Faithful area for one week a month in the summer as an artist in residence to show his work in both the Lodge and the iconic Inn. Sheehan grew up in Rochester, Michigan. After graduating, a high school friend, Jim Barrett, now a Livingston, Montana-based artist, had moved to Silver Gate, outside the park’s northeast entrance, and Sheehan came for a visit and loved the area. “I could live out here,” he said. So in 1980—after three years in the Marine Corps, some college classes at a local community college and Grand Valley State College in Grand Rapids and completing his degree in art and ceramics at Montana State University in Bozeman in 1977—he and Barrett are at the Bozeman Holiday Festival of the Arts, sharing a booth and selling their work. The largest concessioner in Yellowstone at the time was known as TWA Services, and its parkwide gift shops manager saw Sheehan’s work. He was looking for artists to come work in the park and sell their stuff, Sheehan said, and he asked Sheehan if he’d be interested in setting up a kiln and demonstrating his work. “I told him pottery takes a lot of stuff,” Sheehan recalled. Sheehan worked up a cost estimate and a floor plan. He figured everything he needed would cost $6,000 to $7,000, but the company said yes, anyway. Over time, Sheehan built his own kiln in a cabin near the “quad” cabin he and his growing family occupied each summer not far from the Firehole River behind the Old Faithful Lodge. He was surprised, he said, by the ardor people have for Yellowstone. “I figured I’d see a person once, and that would be it,” he said. But lots of people love Yellowstone a lot, visiting once a year or every other year, or even making multiple visits per year. He got to know a lot of repeat visitors who became repeat customers. Sheehan said the images of Yellowstone naturally influence his work. He likes the form of the bison and thinks of them as more a representative image of the park than the grizzly bear. It’s usually easier to see bison than bears, he noted. And bison frequent the Old Faithful area. He laughed that sometimes he could open the door of his cabin and come almost face-to-face with one. “O-Kay, I think I’ll use the other door,” he joked. But he spoke most movingly of mountains. “Mountains drew me out here,” he said. “Their allure and what they did to me—they make me go, ‘Wow.’ I look at the Bridgers (near Bozeman) glowing pink: you don’t see that in Michigan. Spend enough time at Old Faithful, and you’re bound to eventually have a brush with greatness. Sheehan, asked if recalled any celebrities, mentioned three former presidents. He admitted, jokingly, that he sought them out—politely and under the watchful eyes of the guys and gals who talk into their cufflinks, Secret Service agents. President Jimmy Carter and his wife, Rosalynn, visited after his presidency. The Secret Service deemed it acceptable that they be escorted up in the Old Faithful Inn’s Crow’s Nest and up onto the roof. Sheehan said he lingered near the staircase where the Carter’s would have to descend, annoying the Inn’s general manager at the time, who asked Sheehan not to bother the Carters. But Sheehan approached Carter and told him what a good job he’d done since being president. He asked for an autograph, but Carter told him he stopped giving autographs when he learned people later sold them, and he didn’t think that was right. Sheehan got a chance to shake hands with President Bill Clinton in 1996. Bill, Hillary, and Chelsea Clinton visited the park when Bill came to make a speech in Cooke City about stopping the New World Mine Project in a $65 million deal. 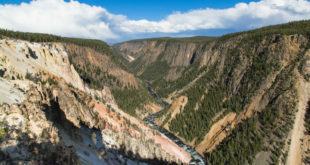 “Yellowstone is more precious than gold,” CNN quoted Clinton saying. But back at the Inn, the First Family gathered on the mezzanine to await an eruption of Old Faithful. “This was before Monica Lewinsky, and they were still a little huggy,” Sheehan recalled. And in August of 2009, Sheehan hung around the Yellowstone General Store lower store at Old Faithful hoping to see President Barack Obama. The store had been temporarily closed to the public, he said, in order to feed the Secret Service crew, and there was a rumor the Obamas might stop in. They did. They came in and had Wilcoxson’s Moose Tracks ice cream. As the First Family was leaving, Sheehan shook Obama’s hand. “I told him, ‘Don’t let the bastards get you down,’ and he cocked his head and said, ‘OK,’” Sheehan recalled. As he and his wife, Becky, raised their three kids—Colleen, Emily and Trevor—the whole family would move from Belgrade to Old Faithful for the summer. As the kids grew up and got old enough to hold jobs, they all had a turn at scooping ice cream at the Old Faithful Lodge. But as they finished college and moved on to other things, and Becky decided to stay in Belgrade for the summer, Carl filled his spare time volunteering for the National Park Service. He would roam through the Upper Geyser Basin chatting with visitors. He remembers a mom with three young kids. They approached him, and mom had a very direct question. “We’d like to know about poop!” Sheehan laughed, recalling her straightforward demeanor. So they examined deer and elk droppings and then buffalo poop that varied by season. The summer poop, when the bison feed on green grass, looked like the typical cow patty, he said. He turned into something of a geyser gazer, getting to know the other gazers and coming to find he has a favorite geyser: Artemisia. Artemisia is north of Morning Glory Pool on the established trail that heads to Biscuit Basin. These days, Sheehan keeps busy with his pottery work near Belgrade. He has a small gallery space at 4069 Linney Road in Bozeman and an online mail order business, www.fireholepottery.com. A 40-plus year career doing what he loves and doing it in Yellowstone is a pretty sweet gig. Sheehan said he loved getting to know the park in-depth. And he enjoyed seeing the awe on people’s faces. “I get to see people look at something they’ve never seen before and might not ever see again. “I’d never thought of it like that,” he said.